7/32" remains grade 80 instead of grade 100. Never Exceed Working Load Limits. A low quality chain sling can cause injury and damage. A look-alike chain sling often found at lower prices is also often advertised to conform to the same safety standards (if at all). Be aware that it may refer to safety ratings in effect decades ago. So for example under the same safety standard a decade ago, a chain lifting sling may be rated to 100% without proof load testing while today it may be 300% with proof load testing. Be assured that we only sell the highest quality chain slings and our advertised safety standards conform to the current ASME standards. To accommodate various applications, a chain sling can be utilized using a vertical hitch, choker hitch, basket hitch or bridle hitch. See diagram below. It is important to know, however, that the chain sling's load capacities change with the type of hitch and angle of use. 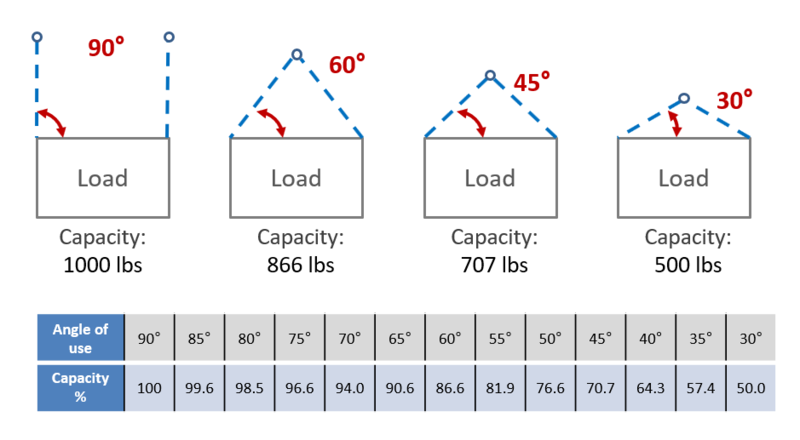 Working load limits (capacity) vary depending on the angle of use. 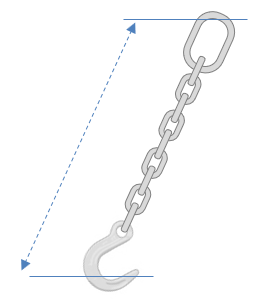 The capacity of a chain sling is reduced as the angle of use declines. See drawing below how a 1,000 lbs capacity is reduced as the angle of use declines. The capacity is always highest at a 90 degree angle of use and smallest at an angle of 30 degrees (or less). Learn: How is the length of a chain sling measured? Sling material comes in three basic types: chain, wire rope, and fabric, each of which has its advantages and limitations. The chain sling has the advantage of being durable, very flexible and its length can be made adjustable. These assemblies employing steel chain are resistant against a load's sharp edges that can be abrading to other softer sling materials. The chain slings is the most durable type of sling and is easily repaired in the event of damage. Chain slings are ideal for harsh environments. A chain sling will tolerate a wide range of temperatures; however, compared to other types, it is relatively expensive and, depending upon the grade of chain used, relatively heavy. The wire rope sling is not quite as durable as a chain sling. It is not as flexible as chain but its greater stiffness can be an advantage if it has to be inserted through a small opening or beneath a load. However, when wrapped around a load, it often tends to deform permanently to the shape of the load. Wire rope suitable for slings comes in a variety of grades and constructions. In most cases looping back and securing the loop with a metal sleeve terminates the rope. This forms a loop or soft eye, the simplest form of sling end. Thimbles are used to support and protect the eye from abrasion. Wire rope is generally cheaper and lighter than chain which can be a plus, particularly for applications that require long lengths. A nylon and polyester sling, commonly refered to also as a fabric sling, has the advantage of lightweight in comparison to a chain sling and a wire rope sling. They are very flexible and relatively soft; therefore, they are suitable in applications were minimal damage to the load’s surface finish is important. The rope is made endless or terminated with an eye by means of a handmade splice. Similar to a wire rope sling, various terminal fittings are available. Without adequate protection, nylon and poly slings are susceptible to being severed when impinging on even a relatively moderate sharp edge. Chain is fabricated from a number of materials; however, only certain grades are acceptable to OSHA for overhead lifting. Grades 80 (G80) and 100 (G100) for chain lifting slings are those types that are suitable to OSHA. The numbers represent 10% of the tensile strength (N/mm2) of the carbon, high (very strong) alloy steel material. Tensile (breaking) strength is dependent on chain size. The testing and rating methods of chain is highly standardized. Attached fittings should at a minimum be of like material. Chain sling components (master links, chains and hooks) are assembled in one of two ways: Mechanically or welded. “Mechanically” assembled means that the fittings are attached to the chain with a hammerlock (see picture of components). This provides the flexibility to change out the fittings later. A “welded” assembly means that all components are permanently welded together. * A Grab Hook is used to grab a chain. It hooks and locks the chain(s) in position for shortening of a chain leg. ** A hammerlock coupling link consists of a pair of body halves, a tubular stud and hardened alloy steel pin. This special type of link can be disassembled and re-used. It is used for joining attachments such as hooks, larger links, or more chain to the chain leg. A chain sling generally consists of a master link, a chain leg, and some type of terminating fitting such as a hoist hook. Most chain sling manufacturers use a standardized sling designation using a three letter combination. For example a chain sling with designation (model) SOG has a single leg (Letter S), with an Oblong Master Link (Letter O) and a Grab Hook (Letter G). The first letter indicates the number of chain legs: S = Single Leg, D = Double Leg, T = Triple Leg, Q = Quadruple Leg, C = Single leg with a normal chain link on the end and no fitting. The second letter indicates they type of master, or end ring: O = Oblong Master Link, P = Pear Shaped Master Link, S = Sling Hook, G = Grab Hook. The third letter (if present) designates the style of hook supplied. S = Sling Hook, G = Grab Hook, F = Foundry Hook, L = Latchlock Hook, O = Oblong Link, H = Hammerlock Couling Link. Basket chain slings have designations as follows: SB = Single Basket, DB = Double Basket, SAL = Single Adjustable Loop, DAL = Double Adjustable Loop.